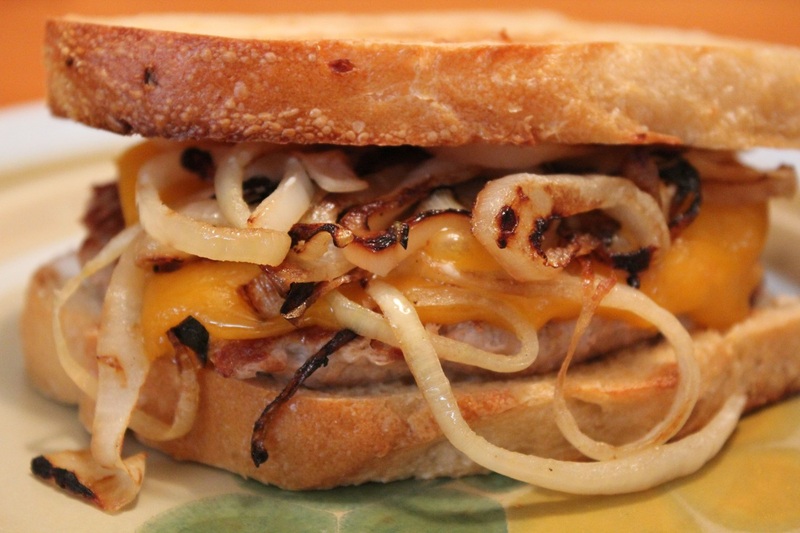 Cheddar cheese and grilled onions turn this sandwich into a mouthwateringly outrageous experience. Divide the ground meat into 4 equal sections. Take each section into the palm of one hand and roll it into a ball. Flatten out each ball so it is really thin. Lightly season each patty with salt and garlic powder. Heat large skillet over medium high heat, add the oil, saute onions until they are very tender and beginning to turn light brown. Remove and set aside. In the same skillet cook patties 1-2 minutes over medium heat. Flip the patties and lightly season with salt and garlic powder, top with cheese during the last 1 minute of cooking. While patties are cooking, toast the sourdough bread. When the bread has toasted, spread a thin layer of mayonnaise on each slice. On top of one piece of toasted bread, place one patty melt, 1/4 of the onions, and finally top each with one more piece of toasted bread. Nutritional information using ground turkey.